If you look up the word “exuberant” in the dictionary, there should be a picture of Jagger. He wears his heart on his sleeve, and that is one of the many reasons we love him. 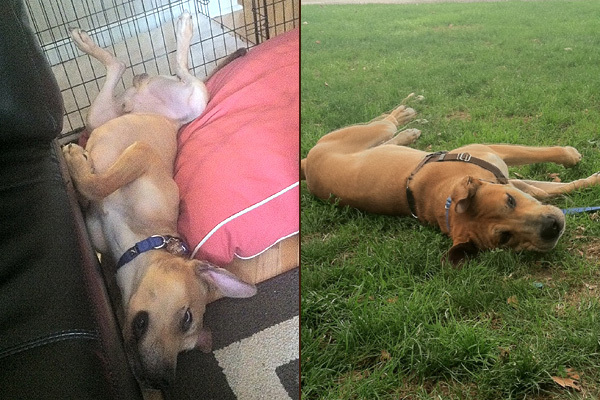 And thankfully for us, we adopted a dog with an extremely warm, affectionate and goofy heart. Not many people would have guessed that his personality would be giddy and happy; Jagger came to us broken down and sick, with little energy and even less personality. Weighing in at about 25 pounds, you could see every bone in his body. His face was cut up and his fur matted and dull. For the first few weeks, he could barely hold any food. Although he was not especially affectionate or warm to us, it was easy to tell that he was a gentle dog who was unsure of his future with humans. After several weeks of TLC, emergency room visits and much patience, his weight started to increase, and his personality bloomed. He soon started his “happy dance” or “alligator impersonation,” as we like to call it. Whenever he gets extremely happy or excited, he falls to his back and wiggles around the floor, opening and closing his mouth, breathing heavily, and writhing with joy. 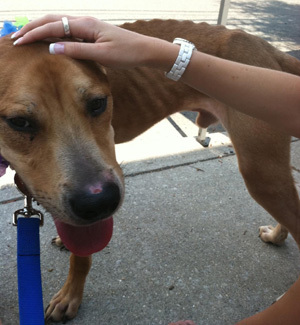 It is a great moment when you see a sad, neglected animal become so happy that he literally cannot contain himself. He now does this dance on a regular basis – when we come home from work, when his “grandparents” come to visit, when we bump into a neighbor in our buildings hallway, or even at the park when the grass is long and soft. Jagger is now 2 years old, 65 pounds and healthy. He has a never ending appetite for food and life, and I thank my lucky stars everyday that we made the wrong turn while looking for the highway and found ourselves at Liberty Humane Society. 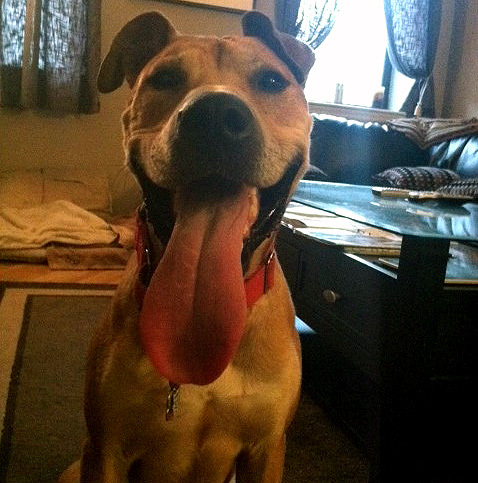 @skreidle Haha, Jagger is the Gene Simmons of pit bulls with that tongue! Haha he is the Gene Simmons of pitties! Everyone comments on it. Thank you again for posting this. People will cross the street when they us and have even said “wow that dog looks mean” – i find it heartbreaking – he is much more scared of them than they can imagine. He will sometimes pull towards people with a big smile, just wanting to say hello, yet they back away because of the way he looks. We need to change perceptions. If only they knew he just wanted to lick them and give them a high five in return for a treat. thanks again, there should be more organizations like this one! @MorganSGertler Thanks Morgan and especially for giving Jagger such a wonderful, loving home! What a heartwarming story so happy for jagger! reading how he does his happy dance i couldn’t get the song I’ve got the moves like jagger out of my head.. We adopted our first pitbull from Liberty Humane Society and he was skinny and heartworm positive and even though the treatment was expensive we couldn’t turn our backs on that sweet boy.. Pitbulls are the best dogs with their affection and silliness best of luck with Jagger he is quite the handsome boy! 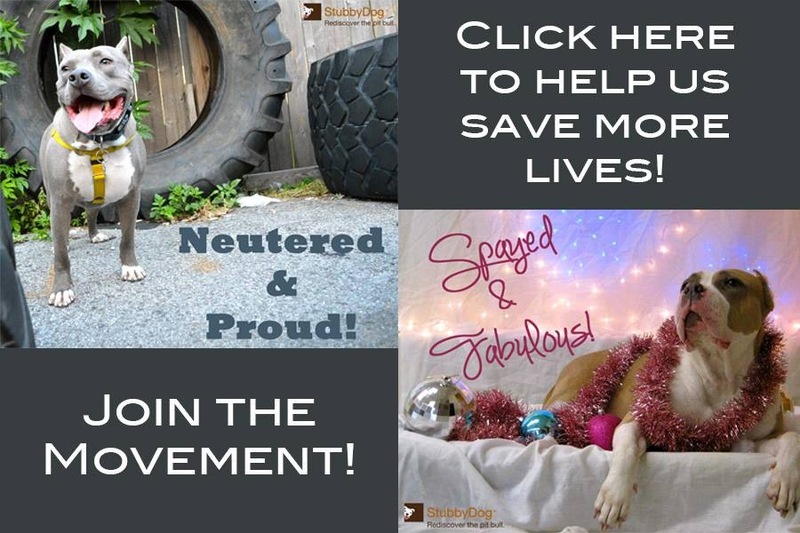 @KellyScrivanich thanks for your comments and thank you so much for adopting a dog that many people would pass by because of the treatment expense.